Affiliate programs are one of the best ways for fashion bloggers to make money. Most bloggers earn at least some revenue every month from affiliate programs. For me, affiliate marketing makes up a little over 25% of my monthly revenue from The Modest Man (my style blog and main source of income right now). So it’s not my number one source of revenue, but it’s definitely important. Affiliate programs bring in $2-3k per month, and closer to $5 per month during the holiday season. When you join an affiliate program, you’re acting as a commission-only salesperson for a brand (or multiple brands). So if you write about a product and link to that product, then someone clicks on your link and makes a purchase, you’ll earn a percentage of that purchase. The commission percentage varies widely, but for fashion bloggers, it’s usually between 4-15%. Now, there are hundreds of affiliate programs that blogger can join, from small independent brands to huge international retailers. But your best bet is joining what’s called an affiliate network. These host multiple affiliate programs for many different brands, all under one software platform and website. The biggest affiliate networks are ShareASale, Rakuten LinkShare, Commission Junction, RewardStyle and Amazon Associates (among others). For fashion bloggers who tend to promote products from many different brands (like clothing, accessories and grooming supplies), the best affiliate networks are Amazon and RewardStyle. Between these two networks, most of the product you write about and link to are covered, which means you’ll get credit for all of your hard work and promotion, even if you don’t have an individual relationship with a brand. Using Amazon and RewardStyle is much easier than tracking down individual affiliate programs for every brand you’d like to promote. Plus, you only have to go through one approval process (for the network itself), rather than an individual approval process for each brand. 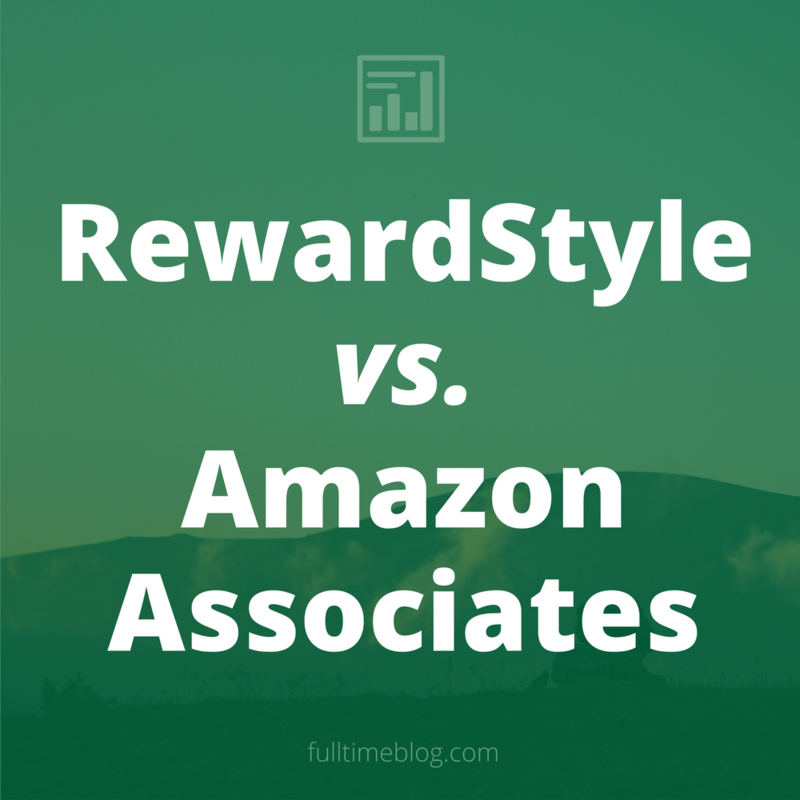 But which is better: Amazon Associates or RewardStyle? Bottom Line: Amazon generates more income than RewardStyle. This means the average monthly income from Amazon was almost 3x higher than the average monthly income from rStyle. Crazy, huh? Amazon revenue continues to grow steadily each month. Even with some ups and downs, the general trend is upward. RewardStyle grows very slowly. Revenue is increasing over time, but at a much slower rate than Amazon. I think this has to do with one very simple fact: Amazon converts higher than any other online retailer (including all of the shops available through rStyle). This means that, even though Amazon’s tracking cookie only lasts 24 hours, it’ll still perform better than, say, Nordstrom or J. Crew. Why? Because Amazon sells everything. Chances are, right now, you have something in your Amazon shopping cart or on your Wishlist. At the very least, there’s probably something you need – big or small – that’s available on Amazon.com. So if you send someone to Amazon by linking to a pair of socks, they might end up buying a pack of batteries. Or a new laptop. Either way, you get a share of their purchase. Amazon.com is a conversion machine. If someone visits Amazon, there’s about a 5% chance they’ll buy something. That’s like grocery store level conversion! For that reason, if a product is available on Amazon and another vendor (like Allen Edmonds shoes), I always link to Amazon. You can participate in Amazon’s affiliate program through RewardStyle. In fact, they have a slightly better commission structure for certain product categories (like fashion and beauty). 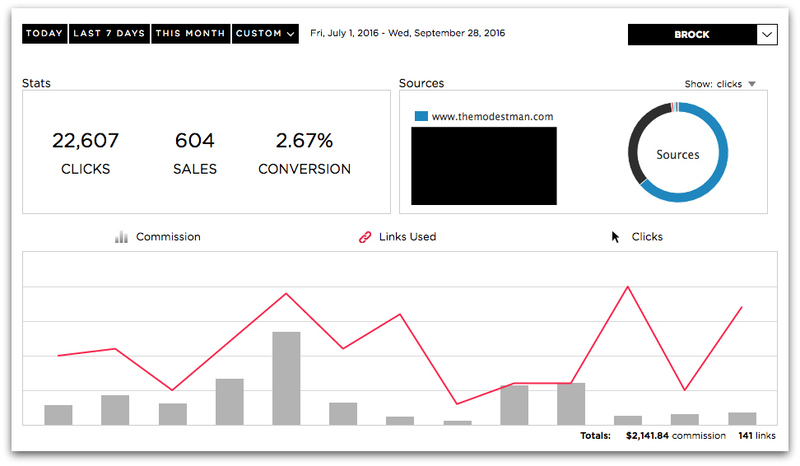 If you have one website, and you want all of your affiliate analytics and payments in one place, I recommend just using rStyle. If you have multiple sites and need to track them separately, I recommend using Amazon Associates separately. Or, if you’ve been rejected by rStyle, you can just use Amazon Associates for now. On that note, drop me a line if you need a referral for rStyle. Given the choice, it’s almost always a safe bet to send people to Amazon over other merchants. Great post, thanks for sharing your numbers! Does rewardstyle cookie for Amazon also expire in 24 hrs? Also, I know that in order for rewardstyle link to earn commission, user must add the item to cart After using the link or the sale doesn’t count. So if you have something sitting in the cart, then you click on an affiliate link and then you make a purchase, that influencer makes no commission. Is the same true for Amazon affiliates also? Love the read, very insightful. I wanted to add, from a source, RewardStyle as company is doing pretty badly, they shutdown their Nor Cal office and let go off all their engineers there. For the long run amazon all the way! Wondering what the value of joining amazon associates is, if amazon is already covered in rStyle? Are there different benefits?